Need to know how to put together a Safe-T-Cover enclosure? There's a video for that. Want some information on backflow prevention best practices? There's a video for that. Want to watch an RPZ dumping water as it was designed to do? That's right — there's a video for that! Our library of videos is always growing as we work to keep you up to date on the backflow prevention and waterworks industries. You can watch them anytime. No one wants a big ugly aluminum enclosure in front of their building where clients can see it. Instead, design systems to place any protective enclosures on the side or behind the building. To make them look even better, hide them with landscaping. If you need to size a custom enclosure for your industrial equipment, this video will help you learn how to design the best one. A simple hand sketch will get you on your way to your custom industrial enclosure. Watch this short video compilation of some recent footage and photos sent to us by testers in the field of flooded vaults. You may change your mind. Assembling a Safe-T-Cover backflow preventer enclosure is fast and simple. With two men and less than five minutes, you’ll have a cover to provide freeze protection and vandal protection for backflow preventers, pumps and valves. Why should RPZ backflow preventers be installed in a heated enclosure instead of inside? Watch what happens when a small, 3”, RPZ fails. Disguising your aluminum enclosure shouldn't cause any headaches. One of the easiest ways to hide an ugly box is with landscaping. Simply encourage the architect and project designer to provide landscaping around the aluminum enclosure so that it won't be visible to the public. This is an RPZ valve installed in an ASSE 1060 approved backflow enclosure. You may think something is wrong but, it's actually doing its job. We happened to be driving by and noticed water pouring out of the enclosure. We stopped, opened it up and shot this video. Over the last several years municipalities and water purveyors have been evolving their standards for backflow valves. Watch a brief overview of cross connection control for the safety of our public water supply. You'll learn what backflow is, why it's bad, and what standards the waterworks industry has provided to keep it from happening. Learn about ASSE standard 1060, heated enclosures and Safe-T-Cover's patented slab-mounted heater. This video from the American Water Works Association (AWWA) is a great educational resource what backflow is, how it can happen, and how to prevent contamination in the public drinking system. 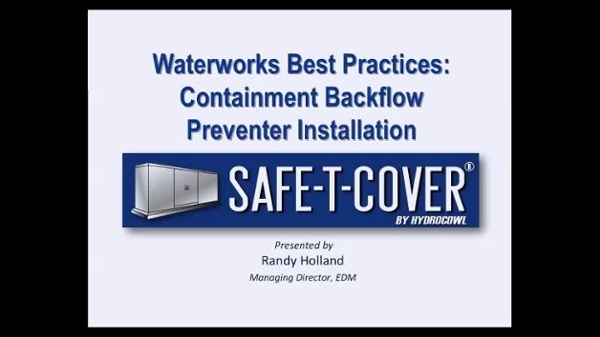 This video from the American Water Works Association (AWWA) outlines the type of backflow prevention devices, when they should be used, and how they can help prevent backflow contaminants into a water system.